Robert uses the word ‘mizzling’ for that soft wetness that’s one step from mist and that you hardly need a hat for. 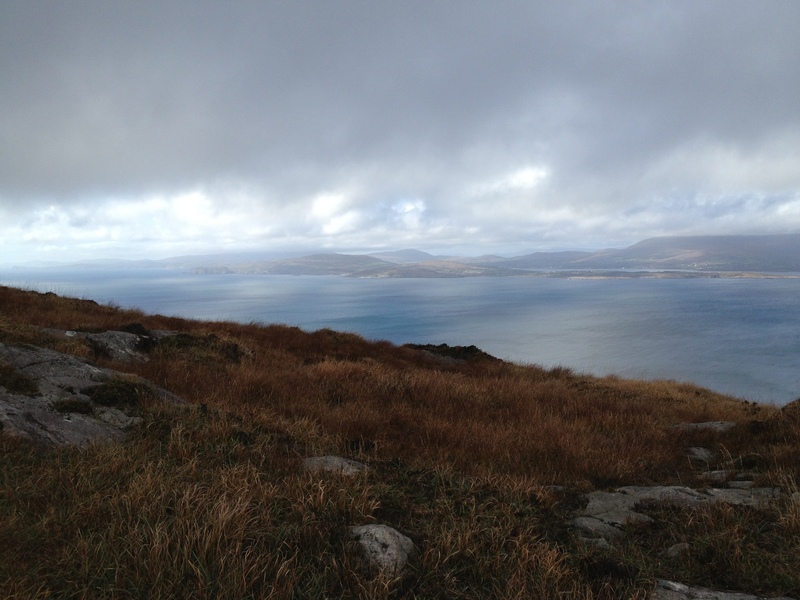 When we walk along our Greenmount Road to the rise with the great view over to Kilcoe, we can see the rain coming across the sea, slanting down here and there from grey clouds, and sometimes it hits us and sometimes it doesn’t and mostly when it does it’s gone again in a few minutes and we dry out in the breeze that follows it. Odd nights we can hear it lashing on the skylights on the top floor and we echo the Cork people who say “’Tis a hoor of a night.” I remember endless days in Vancouver of rain pelting down and everyone with umbrellas and a grey will-this-never-stop misery sinking into the soul. So far – and maybe we are lucky – that isn’t happening here. We haven’t had a day without some sunshine. On November the 5th we walked the lighthouse loop on the Sheep’s Head with barely a cloud in sight – what they call locally a “pet day.” This was our third section of the Sheep’s Head Way and took in yet more stunning scenery and a long section where the trail runs on the brink of vertical cliffs, with the waves crashing and roaring below. It was so hot I got sunburn. That might not happen twice: but then again SHE specializes in the art of surprise. 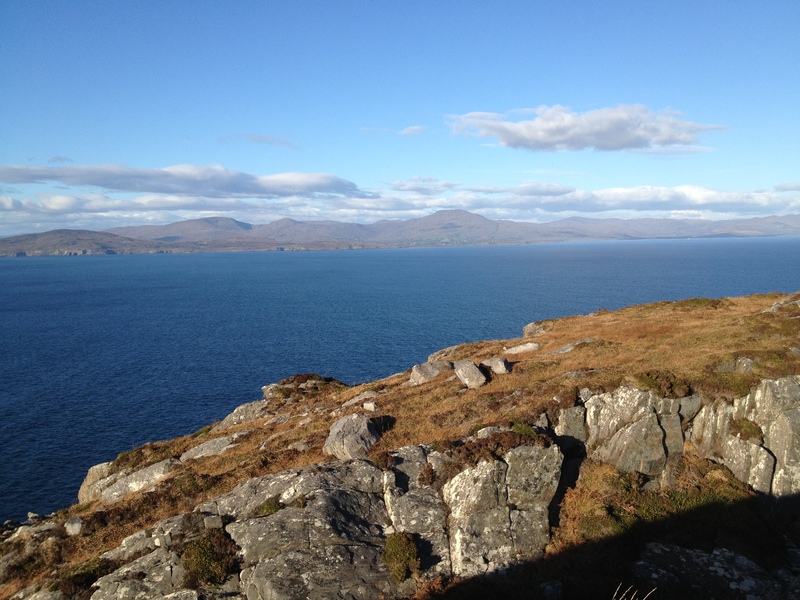 This entry was posted in Sheep's Head Way, Walks, West Cork and tagged Ard Glas, weather. Bookmark the permalink. 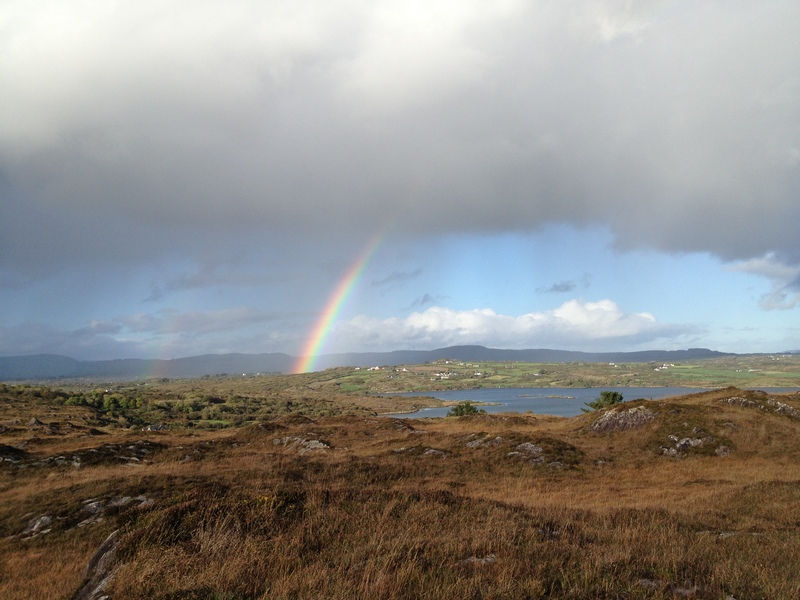 Great photos and description of West Cork weather, Finola. May SHE give you many more grand soft days! At coffee this afternoon my eye was snagged by the weather forecast graphic in this day’s Globe and Mail (I would include it in this response if WordPress allowed such visuals). Today was forecast to be grey & grizzly; tomorrow was also to be grey; Wednesday: the same; Thursday: ditto; Friday, Saturday, Sunday: I think you already see where I am going with this. Finola/Robert, without a doubt you are where the rainbow begins/ends!